Michiana Gutter Pros For Gutter Cleaning can help you clean your home or business gutters every spring and fall to keep them working correctly. This is a seasonal maintenance and cleaning we offer at a great low price. Leaves, debris, grime and dirt, tree branches can build up and keep clogged downspouts, which can cause severe water damage to your roof and fascia of the building adding costly repairs. Water that continues to pour over the gutters or from leaking gutters can end up rotting your home’s foundation, or flooding the basement and crawlspace. By cleaning or even attempting to repair your gutters yourself from on top of your roof is highly not recommended. Call our professional team to clean your gutters. We have the right gutter cleaning tools and the best safety gutter cleaning equipment that we can use while standing firmly on a ladder. It is best to avoid standing on the top three rungs of the ladder and never reach past the side rail. This is an added safety measure our crew adheres to. When our expert gutter cleaning team members work from a ladder, then they will use one bucket for collecting the gutter debris and another bucket is used for carrying tools. Using wire hooks attached to the buckets and to the ladder is another safety measure we use. We always make sure the area below the gutter is clear. 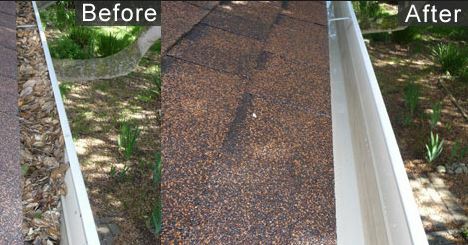 We offer the most affordable gutter clearing prices along with ensuring one hundred percent client satisfaction. Michiana Gutter Pros For Gutter Cleaning is licensed and fully insured. We can clean your gutters which can help in protecting against wood rot and termite damage to fascia of your home. Insects like termites and mosquitoes can breed in the clogged gutters, so it is very critical to keep them clean sand free from these insects. Most people have better things to do on the weekend than to clean their gutters. Let the professionals at Michiana Gutter Pros For Gutter Cleaning do it for you, so you and your family can go on and enjoy the good in life. We offer the best gutter cleaning tips and advice to our clients. Gutter cleaning is a very necessary, but dangerous part of the upkeep of your home. Leaves and debris can clog the gutters and can cause major costly damages. Stay off the ladder to be safe and let our expert team at Michiana Gutter Pros For Gutter Cleaning do it for you. We provide the best interior and exterior gutter cleaning. You can contact us now to get a free quote on cleaning cost.By removing the black streaks off of the exterior of your gutters, it will give them as nice look. Cleaning the dirt and debris from the inside of your gutters will ensure that the downspout is cleaned out correctly so your gutters will work best. Inquire about a gutter guard when you contact us, these will offer you low to no maintenance for your gutters.